The height of your fence will vary depending on what you need it for. The height of your fence will vary depending on what you need it for. But that’s not the only reason why different fences are different heights. Sometimes, your local HOA will have a say, and sometimes it depends on your neighbor’s input. Here are some height considerations to keep in mind before you build your next fence. First of all, you’ll need to think about local rules and regulations about fencing procedures. These are usually set by the laws of your community, town or city. For instance, you’ll probably be able to make the fence your front yard four feet high at most. The fence in your backyard will be capped at six feet. Then you will need to think about the guidelines set by your local HOA, or homeowners association. It’s true that the HOA will have rules about how high your fences are. It’ll also set rules about what color it can be, and what it can be made of. You’ll need to take all of these factors into account when building your new fence. 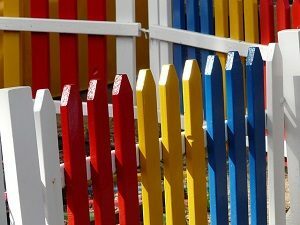 That way, you won’t be subject to fines or even asked to take your fence down if it violates HOA rules. The last thing you will need to consider is why you need the fences in the first place. For instance, you might want a privacy fence. Or you’ll want a fence around your garden to keep deer, foxes, and squirrels out. And then you might want fences to help keep your pets in your yard, or to stop anyone falling into your pool. All of these are important reasons to get some new fences, but you need to keep in mind that they’ll all be different heights, too. This entry was posted on Friday, November 16th, 2018 at 6:57 pm. Both comments and pings are currently closed.